Greedy hoteliers and gigantic architecture are undermining the fifth pillar of Islam – the hajj or pilgrimage to Mecca – claim believers. The commercialisation of religious pilgrimages to the holy cities of Mecca and Medina is stripping the spirituality from the 'trip of a lifetime' obligatory for Muslims. The reduction of global travel costs and the expansion of the middle class in Muslim countries has increased the traffic for hajj, the pilgrimage to Mecca – and there are rich pickings. The official Arab News reported on August 7 that Mecca had few hotel vacancies since the beginning of Ramadan this year, despite the astronomically high rent rates for hotel rooms. It reported: 'Middle-class families cannot afford to stay in hotels close to the Grand Mosque because of high rents that can reach up to Saudi Riyals 7,000 (£1,140) per day. Rates climb according to the proximity of the hotels to the Grand Mosque. For the last week of Ramadan, when Umrah is most popular, 90 percent of rooms have been booked. Less-affluent pilgrims from South Asia and other Muslims are consigned to hotels or guest houses with a single common bathroom for five to six guest rooms, non-working lifts, and other discomforts. The hajj is obligatory once in the life of every Muslim who can afford it, and is performed in the final month of the Islamic lunar calendar. Umrah is a shorter version of hajj, which is popular during Ramadan but may be undertaken at any time. 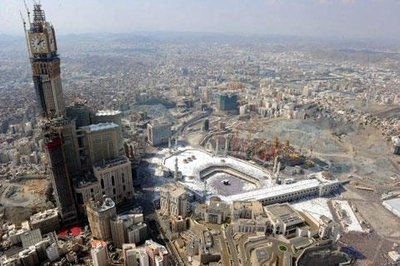 But for Muslim pilgrims, Mecca's recent transformation has caused dismay. The past tradition in which visitors on hajj or Umrah were accommodated in small, basic rooms, often temporarily in private homes, has given way to luxury hotels that are only available to the well-off. Meanwhile, Mecca has seen its real estate value soar in a combination of opportunism and Western-style hubris. The Saudi-owned Al-Arabiya broadcast network observed on July 28 that Mecca already features the highest real-estate prices in the world. A large complex of skyscrapers, valued at £3.3 billion, has been erected next to the Grand Mosque in Mecca by the Jabal Omar Development Company. The Jabal Omar scheme includes a promise that a Hilton hotel will operate there, along with 26 more new hotels, and management contracts including Hyatt International and Marriott International. More projects costed at £12.24 bn are underway in Mecca, with a total of £75 bn in new works anticipated over the coming 10 years. Some critics have described this refashioning, which includes the destruction of Mecca's historic architectural legacy, as a 'Manhattanisation' inappropriate for a Muslim holy city. In one of the worst examples of the monuments foisted on the site, the 'Mecca Royal Clock Tower', outside the Grand Mosque, now overlooks the holy Ka'bah that pilgrims will visit, with a clock face many times larger than the Ka'bah itself. Some Muslims claim it is a direct bid to outdo Greenwich as the internationally agreed centre of world time – a point reinforced by its remarkable likeness to Westminster's St Stephen's Tower which houses Big Ben, and to the Empire State Building. In the weekend edition of the London Financial Times for August 6/7, the columnist Christopher Caldwell commented on plans for construction of a mile-high 'Kingdom Tower' in Jeddah, Saudi Arabia, by the billionaire prince Alwaleed bin Talal. Caldwell and others have noted the irony that this concept for the world's tallest building includes participation by the Saudi Binladin Group, a construction and investment holding, almost one decade after Osama Bin Laden, a scion of the family controlling that enterprise, realised the destruction by terrorism of the world's then-highest structures, the World Trade Centre in Manhattan. Prior to the conquest in 1924-25 of Mecca and Medina by the Sa'ud family and its allies in the Wahhabi sect, the walls of the Grand Mosque were no higher than the roof of the Ka'bah. The Saudis, with the eventual participation of the aforementioned Binladin Group, extended the minarets and walls of the mosque to diminish the Ka'bah. Now the Ka'bah is dwarfed by the clock tower that is not even part of the mosque.